It's time for what we've been hinting at (not so subtly, might we add) all week. It's our 450th review here at SuperPhillip Central! We have this reviewing thing down to a science by now. Not really. Anyway, we needed a big game for this moment, so we have for you Super Mario 3D World. Is it the savior of the Wii U? Man, what a loaded and obnoxious question that is! In all seriousness, here's our review. 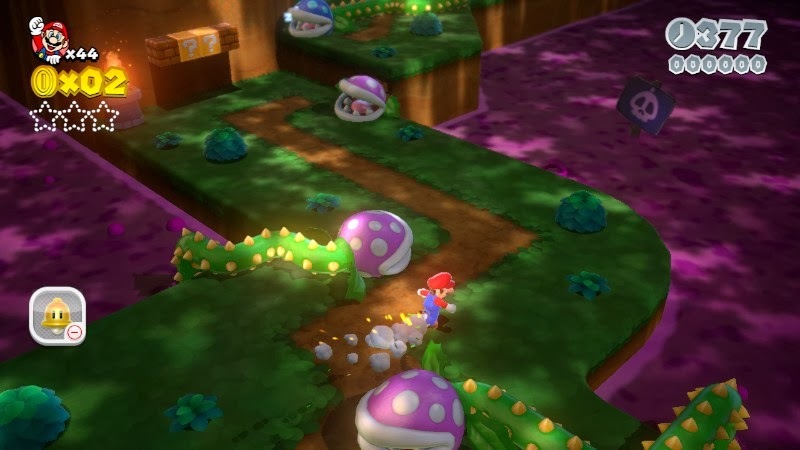 Back at E3 of this year, there was a lot of hype surrounding this mysterious new "3D Mario action game" that series creator Shigeru Miyamoto said would be revealed at the event. Many simply assumed that he meant a game with the scope of Super Mario Galaxy. When the actual title was more akin to Super Mario 3D Land at first glance, disappointment was widespread through the gaming community. However, months on from the initial E3 trailer, subsequent trailers showing more creativity in the levels and content made gamers go from down on the game to hyped once more. Now that the game in question, Super Mario 3D World for Wii U, is out, a lot of people, including this reviewer, feel very silly for ever doubting Nintendo EAD Tokyo, especially based off their exquisite track record. One starlit night, Mario, Luigi, Peach and Toad are walking on a path just beyond the Mushroom Kingdom's castle. It's there that they come across a slanted, clear pipe. Perhaps the first time that Mario and Luigi do some actual plumbing within a mainline game, the duo of brothers fix the pipe. Suddenly, a being known as a Sprixie comes out of the pipe with a look of worry on its face. 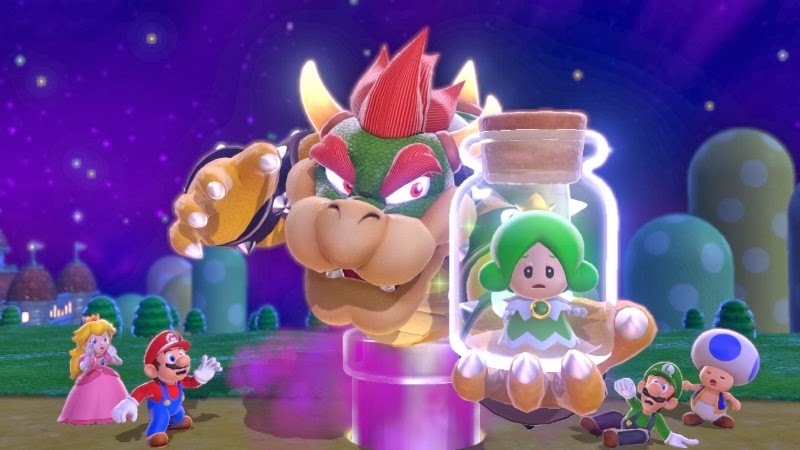 Soon, the reason for its expression pops up of the pipe, Bowser, who captures the fairy in a bottle and retreats in the pipe. Mario and friends pursue, hopping into the pipe after the Koopa King, entering into the Sprixie Kingdom, where six other faeries are being held hostage. It's up to Mario, Luigi, Peach, and Toad to save them and give Bowser the comeuppance he's deserving of. 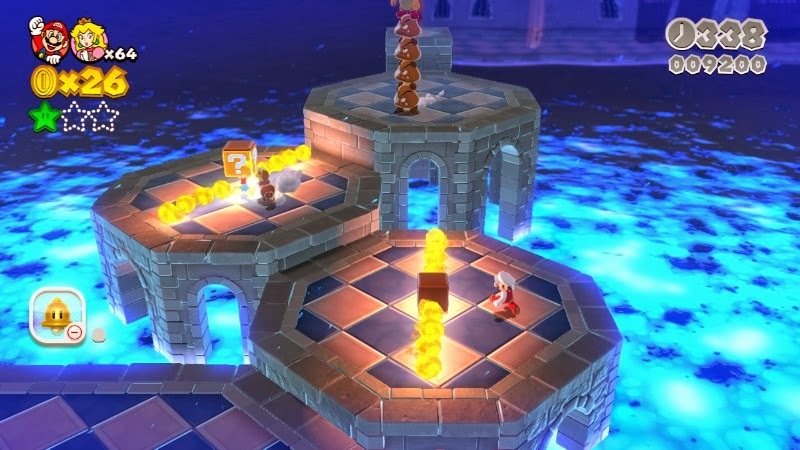 Super Mario 3D World might just be seen as a "sequel" to Super Mario 3D Land, but it goes out of its way to be a much improved game than its 3DS counterpart-- and its 3DS counterpart was no slouch, either. Starting off, Mario and friends arrive on an overworld, very reminiscent of the New Super Mario Bros. series and Super Mario Bros. 3. Though unlike those games, it's able to be fully traversed. However, you have to play the levels scattered around the map in a certain order. Occasionally the path will split, offering two levels to choose from. 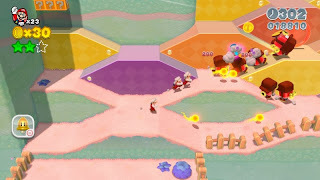 It's a nice change of pace for the series, and much better than Super Mario 3D Land's super-linear world map structure. to make the plumber's journey dangerous. 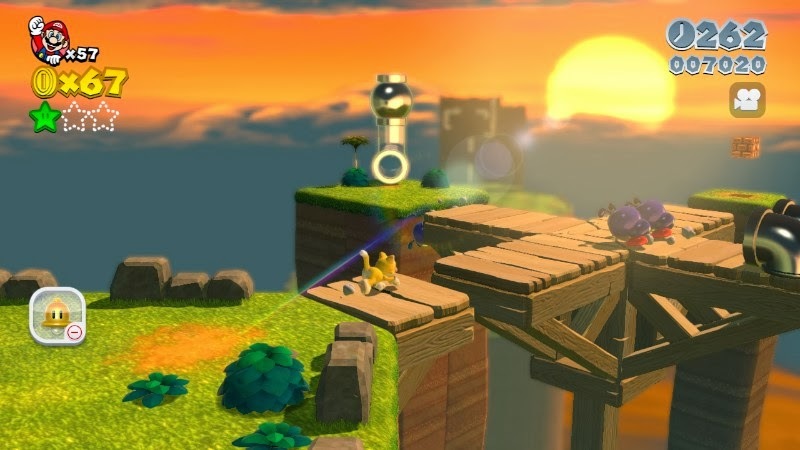 Super Mario 3D World's levels are created similarly to Super Mario 3D Land's. You have a free-roaming level, which you can move around a 3D area, but the levels themselves have a 2D-like feel, going so far as to having a flagpole at the end, vintage Super Mario Bros. 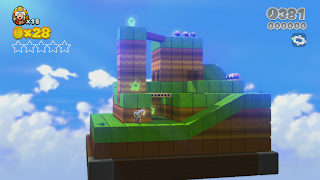 In an essence, Super Mario 3D World is a game that would be like if Super Mario Bros. and Super Mario 64 had a baby. I don't know the particulars of how a birth like that would happen between cartridges, but that's neither here nor there. Levels design-wise are positively phenomenal. While the first two worlds lead you into possibly having false impressions about what the game's design-- and even then, there's some genuinely genius levels in these early worlds, such as a level that focuses heavily on shadows, the third world introduces some insanely and devilishly clever content. There's a level that is straight-up ode to Super Mario Kart. There's a level where you switch between two trains running parallel to one another, rushing through as you avoid Bullet Bills being blasted at you. Then there's nods to Super Mario Galaxy, where blocks appear and disappear according to the beat of the music, and a level set in a carnival, where you swing from trapeze to trapeze as if you were working as an act of a three-ring circus. The point of my gushing of these particular levels-- and there's SO many more than can possibly fit inside this review without spoiling everything about the game-- is that you are constantly being thrown new level mechanic after new level mechanic. The developers wisely crafted the game so that you never grow tired of a certain level gimmick or mechanic. They never outstay their welcome, which many games nowadays still don't get right. That's just the experience and excellence of Nintendo EAD Tokyo. The difficulty of Super Mario 3D World doesn't get very challenging at first. 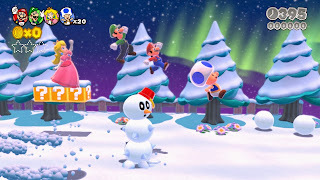 However, when you go about collecting the trio of hidden or out-of-the-way Green Stars in each level (think of these as the Star Coins of Super Mario 3D Land, as they serve the same purpose-- unlocking later levels), as well as going after the stamp located in every story level, the game gets much harder. Some are placed in some insanely devious locations, whether they be hard to find or require daredevil-like fortitude to nab. altered via the right analog stick. hog all the spotlight, it's Captain Toad! 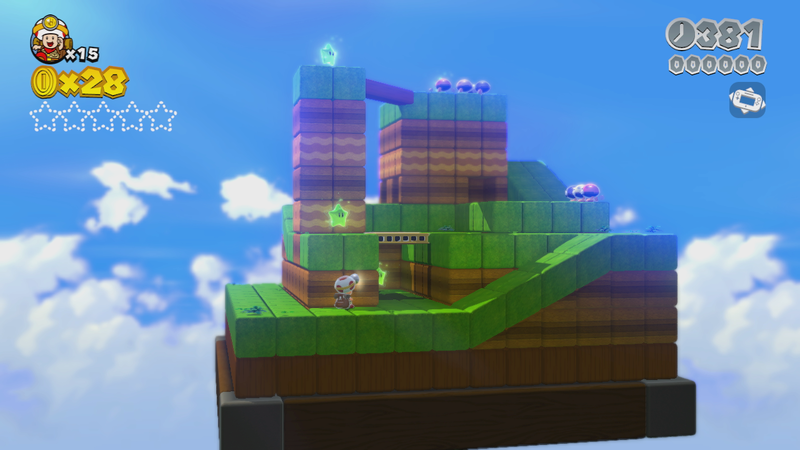 Meanwhile, Mystery Houses have a more interesting use in Super Mario 3D World than its 3DS predecessor. Mystery Houses have a series of challenges all in a row that the player must get through to earn all of the Green Stars that house has. These timed challenges can be anything like defeating a group of enemies to reaching the Green Star before the clock expires. Lastly, there are blockades, events on the world map that pit you against familiar foes or a boss character. The latter kinds of characters also show up at the end of each world, and while they have interesting mechanics to them, the majority of them are real pushovers. However, the final bout with Bowser is one of the cooler Bowser battles in series history. Teach Hisstocrat a lesson in humility. Super Mario 3D Land on the Nintendo 3DS introduced the Boomerang Flower and its accompanying suit into the mix. Super Mario 3D World returns with this novel costume, as well as the game's tribute to Super Mario Bros. 3 with the Tanooki Suit. Other returning items include the Fire Flower, Mega Mushroom, and Propeller Block. 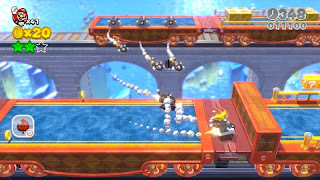 However, there's also various new transformations and helpful trinkets to use on Bowser's forces. 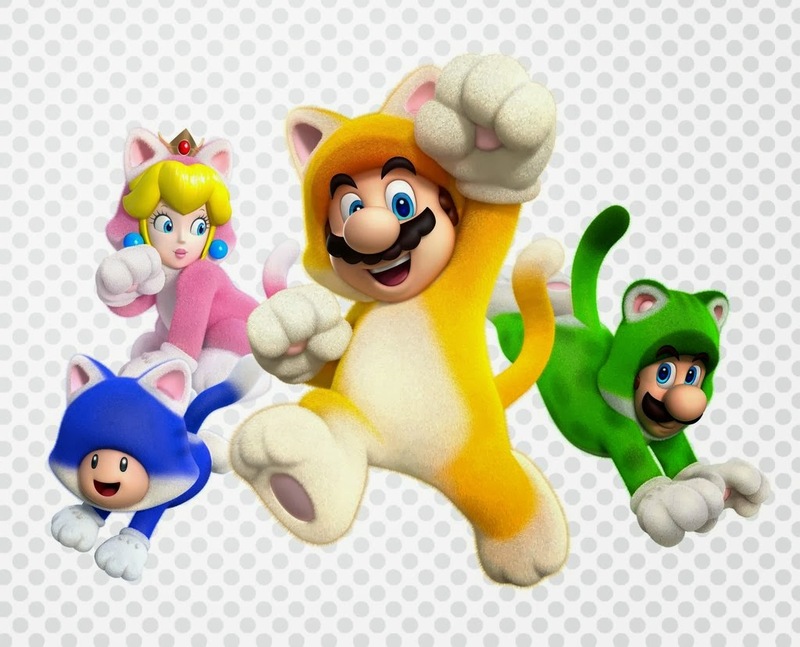 The first transformation that was revealed during the E3 trailer is Cat Mario. Able to pounce on enemies, swipe foes with his claws, as well as climb up walls and flagpoles for a limited time, this new power-up is the cat's meow. Sorry for the pun... Anyway, it's an awesome addition to Mario's suit repertoire, and it can easily stand with the classics in the series. This new suit is the cat's pajamas. 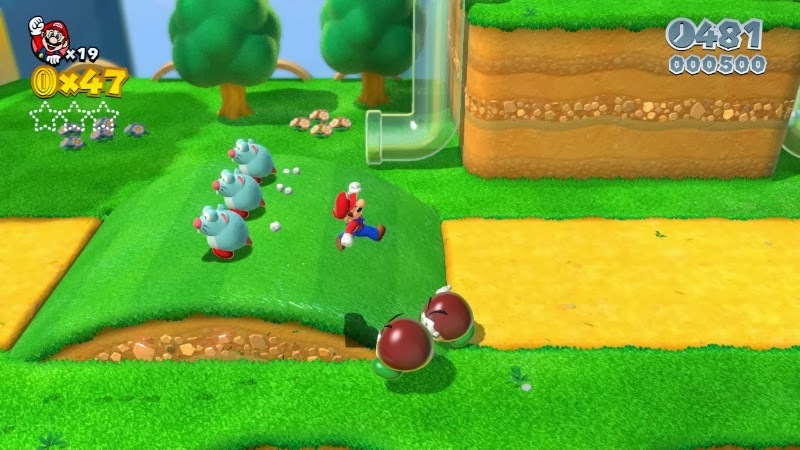 Another new power-up within Super Mario 3D World is the Double Cherry. When picked up, this creates a clone of the character who collected it. Each clone and its original move as a single unit, so if you move right, all of your other clones will move right as well. It's beyond cool to be in control of five Toads, effortlessly laying waste to an army of Goombas. Other items include a wearable block that allows Mario and friends to fire off cannonballs, as well as a block that is used in ghost houses to shine a light on pesky Boos and other haunting entities. Mario's long, lost twins found... next Maury. By far the most exciting addition to Super Mario 3D World is multiplayer, which is something that a 3D Mario game has never had. Until now, of course. Up to four players can jump in and jump out. Characters can be changed before each level, and each of these characters has their own strengths and weaknesses. Mario is your all-around, well-balanced hero. Luigi adapts his Super Mario Bros. 2 controls, having floaty jumps and is unable to stop as fast as other characters. Peach can hover in the air for a few moments, though she is rather slow moving, while Toad is the fastest of the four. to be better than one! The neat thing about Super Mario 3D World is that essentially every Wii-related controller is supported for multiplayer. However, a Wii U GamePad is required for at least one player, as some levels (including Captain Toad ones) require the functionality of the GamePad. Otherwise, your friends and family can use the Wii Remote by itself, the Wii Remote/Nunchuk combination, the Classic Controller, or the Wii U Pro Controller. go dancing in my head. Multiplayer is an absolute riot. I was only able to try it out with another player, but even then, it was a blast. Yelling at one another when we caused one of us or both of us to fall to our dooms, giving a fist bump when both of us hit the top of the flagpole at the end of a level, and frantically rushing through low time limit levels while giggling like schoolboys are all fond memories I have of the multiplayer. 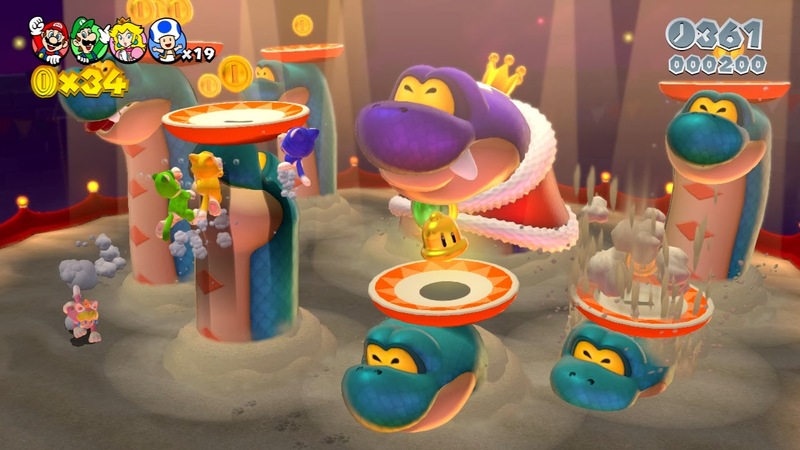 The multiplayer not only makes the game have a cooperative aspect to it, but there's also plenty of potential for competition, as the player with the best score in a given level gets to wear a crown in the next one. There is an issue I have with the game's multiplayer, however. It's all too easy to start a run and pick up a teammate in the process since both actions are mapped to the same button. This makes it not that hard to accidentally pick up a partner and toss them into danger. This is an event that happened all too often within my playtime with the game. 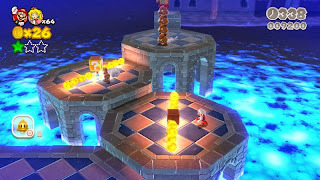 Regardless, don't think that Super Mario 3D World's levels were built for multiplayer solely. No, the game is still a highly entertaining one by your lonesome. That fact just shows how talented Nintendo EAD Tokyo were when they designed the levels. They can be enjoyed whether alone, with a partner, or in a group. water in this jungle isn't safe to drink. Mario and friends control so fluidly and tightly that I seldom, if ever, felt that a death in the game wasn't my fault. Sure, an occasional bad camera angle or zoom out might have cost me a life, but feeling-wise, Mario and the gang moved precisely in relation to every button and analog stick shift that I made. 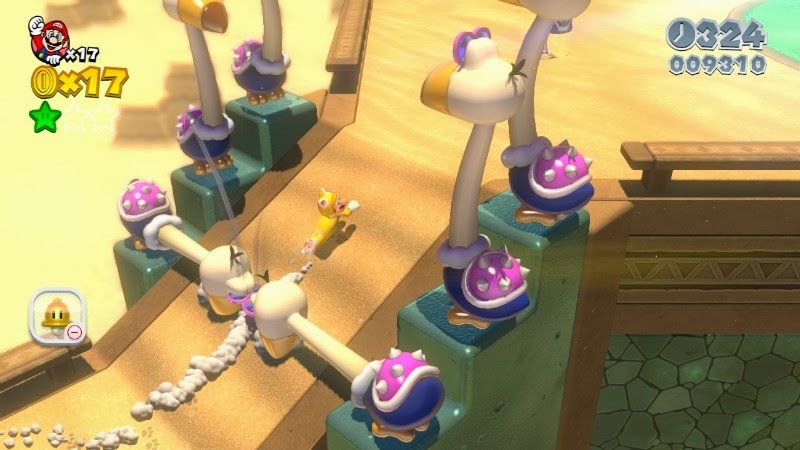 Super Mario 3D World will take most gamers somewhere around 10 hours to beat. Nonetheless, I say that if you're someone who just wants to go through the game without collecting everything. If you're a completionist like me, then your playtime will reach upwards of 25 hours. 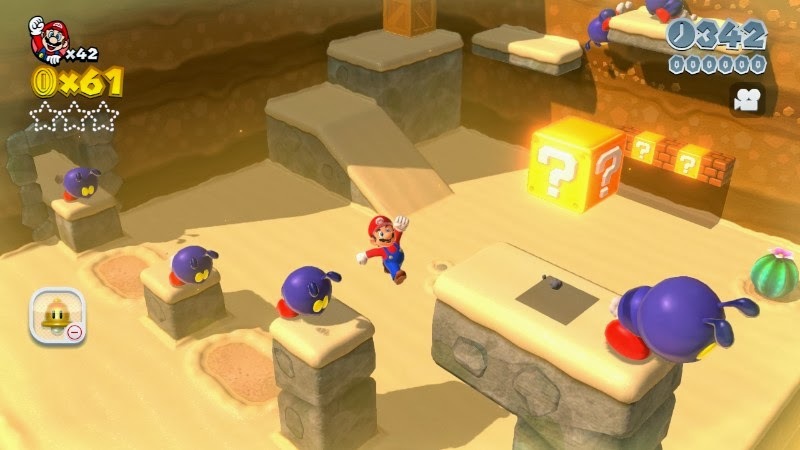 Just like with New Super Mario Bros. Wii, 2, U, and Super Mario 3D Land, there are up to five stars on your save file that can be earned for performing certain tasks. No doubt you'll want to collect all of the Green Stars and stamps if you're anything like me and want the most out of your money. makes most levels much easier. Super Mario 3D World has a massively amazing art style. It might not be on the edge of technology, but it does surprise and delight, especially with the game's superb lighting and special effects. Character models look sensational, environments are full of detail, and the whole package runs at a super steady frame-rate. 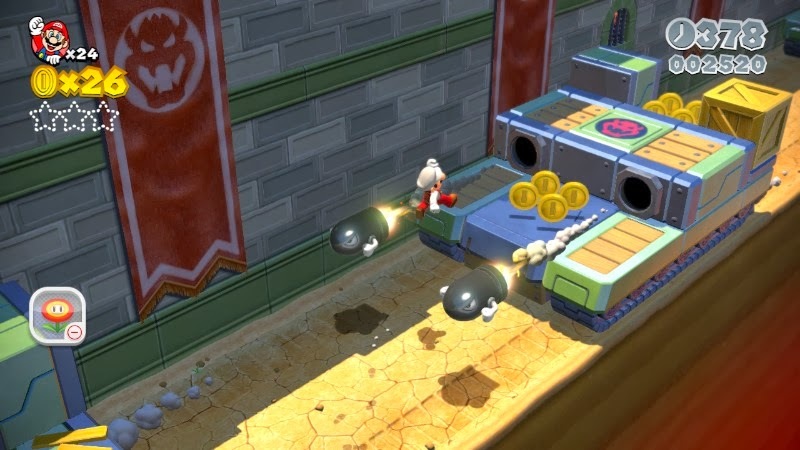 It wouldn't be a Mario game without classic sound effects, and these are in steady supply in Super Mario 3D World. Meanwhile, the music ranges from stellar big band affairs to orchestral delights. All in all, Super Mario 3D World's presentation is phenomenal, and it's finally the type of Mario we all wanted to see in high definition glory. No time to take in the sights, Mario! There's a kingdom to save! By far one of the most impressive Wii U games, Super Mario 3D World is a fantastic and wondrous game that oozes with creativity out of almost every orifice. It might not use the Wii U GamePad in overly creative ways, but it does grant Wii U owners with a terrific title to desire on the ever-increasing list of must-haves for the system. 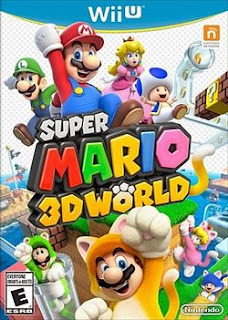 Whether you play alone or with others, Super Mario 3D World is a finely designed game that you will want to play over and over again. Mario is king when it comes to gameplay, and the master has returned to his throne.